More info:Price varies depending on cabin, vessel and date. You will have the choice of lower deck, main deck or VIP cabins, and luxury or luxury superior vessels. All cabins have en-suite and air-con. Includes transfers, excursions, breakfast and lunch. Spend eight days exploring Croatia’s beautiful, historic coast and islands on a luxury mini cruiser. Carrying a maximum of 38 passengers, this cruise ship can visit small ports and beautiful swimming bays that pepper the Croatian coastline, which larger boats simply can’t enter. The local cafes and restaurants will happily cater for all our guests, too, ensuring your holiday money goes directly into the hands of local people. 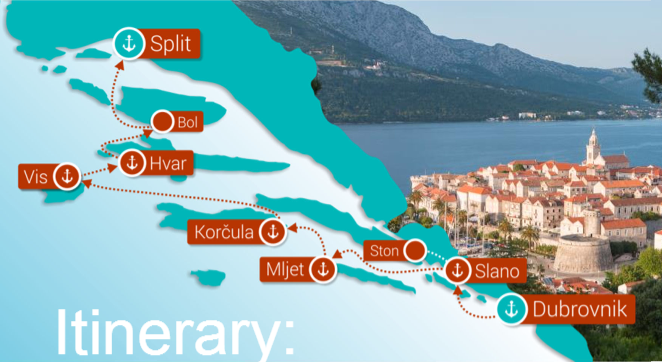 This one-way cruise goes from Dubrovnik to Split or vice versa, taking in the best of the Southern Dalmatia islands. Lots of extra services are included, too, such as wine and gourmet experiences, included in the price. Relax on the spacious decks in the morning or swim in the clear waters of the Adriatic, and then in the evenings explore the small historical towns and harbours along the coast. Dubrovnik is a highlight, but Split, built into the remains of the Roman Emperor Diocletian’s huge palace, is also wonderful, enchanting and lively. In between, enjoy the smaller towns, villages and open space along the coast, all outstanding in their own right. These include the walled village of Ston, Mljet National Park, St Mary Isle and the ancient Benedictine monastery, Korcula Old Town, and Bisevo Island which is home to the famous Blue Cave. The ship has just 19 cabins all with air-conditioning, ensuite shower and WC. There is a large sun deck and swim platform with sea ladders for easy access into the water, two outdoor showers, and a restaurant and bar. The management of these vessels is a member of the Green Sail initiative. Members are dedicated to sustainable tourism in Croatia and are passionate about raising awareness of environmental, economic and sustainable tourism policies in Croatia. They believe the promotion of environmental awareness in the region will have a prolonged and positive impact on the livelihoods of the local people and maintain Croatia as a sustainable tourism destination for future generations. Green Sail aims to educate and build awareness amongst all stakeholders about sustainability and ‘Green Tourism’ in Croatia through activities and continued partnerships with local businesses. Green Sail is active on a local level in Croatia and is committed to discussion, raising awareness and implementing changes that will improve sustainability in Croatia. It is vital sustainable tourism is embraced in Croatia to preserve its natural beauty as well as protect local stakeholders. Green Sail works with local businesses and captains to ensure business is not outsourced and remains a unique Croatian experience for their guests. Green Sail is the first step to initiating a ‘Green’ change in Croatia and educating current suppliers is proving promising. We share our responsibility to protect the environment, customs and traditions of the region with our guests and find this is appreciated as they gain knowledge and receive a culturally diverse experience whilst travelling. Green Sail aims to improve the condition of some of the beaches along the Dalmatian coast, as well as promote sustainability throughout Croatia through partnerships with local businesses learning and educating the wider community of our policies on sustainable tourism. + Raise awareness of the importance of Green Tourism in the Adriatic. + Promote environmentally-friendly policies with our local business partners. + Actively participate in local community projects to clean up beaches/ports. + Educate stakeholders on sustainability practices and how to manage tourism sustainably in Croatia. Our vessels are captained and crewed by Croatians, and most of the produce served on board in sourced locally, sometimes from the crew’s family members, helping the economy, and the environment by less travelled produce. reduce the environmental impact and did NOT use any conservation or recycling. livelihood depends on the local environment, and they are very careful to look after their environment as best they can. I feel that we benefited local people by boosting their economy - as this is what they shared with us. There is an ongoing review in Croatia about how water is provided. Water-coolers have been tried but proved problematic as they can be unstable when the vessel is in motion, especially if the sea isn’t flat. Additionally there is little water available on some islands so there it isn’t possible to collect water locally from the system. The heat! (Only kidding). The whole experience was fantastic. The places we visited (mostly). The cooling sea swims, great food, and the people we met. We loved Korcula! Mljet, and Hvar, in that order, although Dubrovnik and Split are spectacular. Take the tours, as they are fun, and interesting. Don't expect sandy beaches. Makarska is a "traditional" holiday town. Lots of cheap "tat" for sale in the market and the beaches were rammed. If there's a big queue for the cable car in Dubrovnik, get a taxi instead. Its a must see, and do it at sunset. engaging. On board catering was exceptional. The whole holiday was well managed from start to finish. thoroughly professional and friendly and the rep (Antonio) could not have been more accommodating. We met an incredible, lively and fun group of fellow travellers from the UK, South Africa, Norway, Australia and New Zealand - which made our time on board an absolute pleasure. We loved the daily swim stops, the food and drink on board and the chance to explore each port in the evenings. Cabins were more spacious than we had imagined (we were on the lower deck) and there was plenty of outdoor and indoor public space on board so the ship never felt crowded, despite being pretty much at capacity. the balcony. The view is better too. provided services to us. As to the last two items, I didn't particularly notice any effects there. Some of the places were so overcrowded esp. Dubrovnik that impact on environment is negative. swimming stops along the way. While it did support one village and we did have local guides I don’t think it supported the Croatian locals THAT much. I still think that there is room for improvement. I was incredibly disappointed with the amount of plastic that was used from the 500ml bottle of water (you could drink 1L in total a day - so 2 bottles per person per day mimimum) to wrapping of food, to the plastic wrapped toiletries and so much more. The amount of plastic waste in my opinion was shocking and therefore did not meet what I would think that a company supporting conservation and reducing the environmental impact on our earth would support. vessels themselves provide a solution to the lack of accommodation (only prevalent from May - September) and they are trying to avoid exacerbating the lack of water. (our guide was not very helpful and often gave misleading information); be flexible about the organization and the timetable. plastic. I would suggest a big water container to be refilled in personal bottles with a fixed fee included in the price of the tour. cash. Also take some reading material as there are quite a few hours motoring on the boat where not much is going on. 1. The local Croatian people (crew, guides, restaurant/shop staff, etc.) were fantastic - so friendly, helpful and spoke such good English. To mark one crew member out, Tomy was a great hit with everyone, funny and with just the right level of familiarity. 2. We enjoyed having time in places like Korcula and Hvar to explore the town, both with a guided tour and then on our own. It is nice to have a few meals ashore, too, which we always find interesting. We have noticed that other tours cram the two islands into one day, which would be a pity. 3. It was a good idea to have a Farewell Party on our last evening on the boat, with excellent live music (father and daughter duo) - it was a lively and hilarious evening for everyone! There should have been a free first drink with the meal, though, as with all other meals. Mljet Nat. Park are all included, too, so there aren't many extra costs.